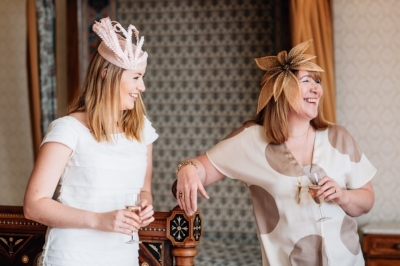 When is a fascinator not a fascinator? What is the difference between a fascinator and a headpiece? And while we’re talking about it, what are hatinators, percher hats, cocktail hats, saucer hats, button hats… the list goes on! Let’s start simply! Hats, as we all know, are ‘A shaped covering for the head worn for warmth, as a fashion item, or as part of a uniform’ as described by the Oxford English Dictionary. The most controversial term in the hat wearing world! They reappeared in the 1990s, when they were generally a small hair decoration, often with feathers, on a clip, comb or even a headband. They were worn with formal attire and became regular features of wedding outfits. 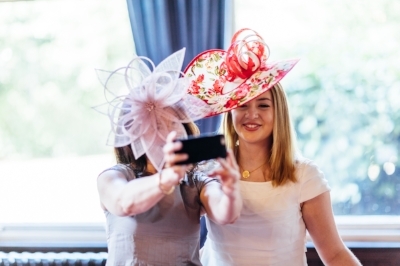 Fascinators, officially, are basically the trimming without a hat, so if it has a base of 4 inches or more, according to the powers that be at Royal Ascot, it isn’t a fascinator any more. But in general circulation, the term fascinator seems to be used for anything smaller than a hat and without crown and brim. A headpiece is basically anything worn on the head, either for decoration or to perform a function. Simple! Hatinators are more than a fascinator, but are not a traditional hat with a brim and a crown. They can also be descriped as a percher hat, as they perch at a jaunty angle to the front of the head. These are a really popular choice, as they allow your face to be seen and you can still have a gorgeous hairstyle too, but they can perhaps be more formal than a fascinator. In modern times, cocktail hats were here first, and this is something that is definitely mixed up with the term fascinator. Cocktail hats were made popular by the film industry in the 1930s. Wardrobe departments would make dazzlingly glamorous designs for new film stars to wear and of course they caught on, being worn by fashionable ladies to balls, garden parties and high society occasions. Worn on the side of the head, anything really goes for a cocktail hat, but they are more substantial and more of a hat style base than a fascinator. Other names you might come across are percher hats, button hats, saucer hats. Percher hats are so named because they do as they are described – they sit perched on top of your head, so this could also be a headpiece, hatinator or cocktail hat. A button hat is simply describing the shape of the base, in a button shape. Saucer hats again are just a descriptive name for the shape; they are the larger, saucer shaped headpieces. Basically there are lots of names and lots of varieties and lots of types of hats will have lots of different types of names. The world of millinery can be a confusing place, but hopefully I have helped a little with this post. If it hasn’t been any help at all, or confused you even more, please feel free to get in touch with me at any point… I am always happy to help and offer advice on your hat wearing adventure!